Hello & Welcome! 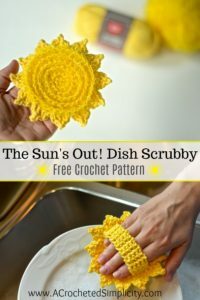 This dish scrubby was the project we made during our 5th Mini-Mystery Crochet Along. If you haven’t already done so, please make sure to sign-up for our newsletter so that you don’t miss out on future mini-mystery crochet alongs! I always send out a newsletter a couple days before the next MMCAL begins so you have time to choose yarn from your stash and get everything ready. For this project I chose to use some Red Heart Yarn’s Scrubby Smoothie & Red Heart Scrubby Sparkle I had in my stash. If you haven’t seen Red Heart Yarns Scrubby Smoothie, this is a soft 100% cotton yarn. If you do not have any brand of scrubby yarn in your stash, you can easily substitute cotton yarn. Yarn: Worsted Weight / 4 Yarn – I used Red Heart Yarn’s Scrubby Smoothie & Red Heart Scrubby Sparkle for mine. If you do not want to use the scrubby type yarns, you can use all cotton. Note: The coaster is worked in continuous rounds to keep from having an unsightly seam. Do not join at the end of each round, instead, use a scrap piece of yarn to keep track of the beginning of each round. Move the scrap of yarn up as you complete each round. Designer Note: If you prefer beginning w/ a ch 2, sl st in the 2nd ch to form a ring, instead of a Magic Ring, you can certainly use that method with no issues. Rnd 2: Working in BLO, 2 sc in each st around. (12 sts) *Place a locking stitch marker in the FLO of the 1st st you can see from Rnd 1. This is to mark where you begin the Sun’s Scrubby Center later. Do not fasten off. Continue on to Flames. DIAMETER AT THIS POINT SHOULD BE APPROXIMATELY 3″. Fasten off. Weave in ends. Continue on to Hand Loop. Fasten off leaving an 8″ tail of yarn to sew the hand loop onto the back of the scrubby. Using a yarn needle, sew the short edges of the hand loop onto the back of the scrubby to create a loop. See Pics in this pattern. Continue on to Sun’s Scrubby Center. 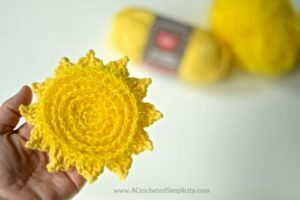 Rnd 1 (RS): Using the scrubby yarn and a 4.00mm crochet hook, join yarn w/ a sc (click HERE for tutorial) in the FLO of the centermost st from Rnd 1 of Center of the Sun, working in a spiral, sc in the FLO of every st thru rnd 6 of Center of the Sun. Fasten off. Weave in ends. You’re new dish scrubby is complete!!! We hope to see you soon! 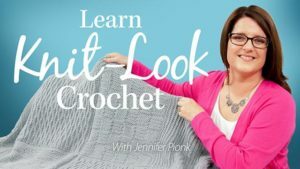 In the meantime, check out our Free Crochet Patterns and join us in the Facebook Community Group!